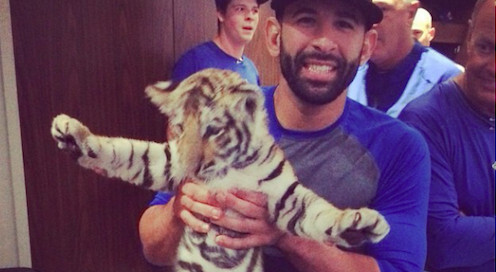 The International Fund for Animal Welfare is slamming the Toronto Blue Jays for bringing a baby lion as well as a tiger cub into its dressing room for a rather unconventional photo op. “The Toronto Blue Jays are heroes to countless kids (and quite a few adults) across Canada. But there is nothing heroic about players posting photos to social media showing them posing with lion and tiger cubs in their dressing room,” wrote Sheryl Fink, who is the IFAW’s Director of Wildlife Campaigns in Canada. Major League Baseball players Jose Bautista, Edwin Encarnacion and Jose Reyes posted photos of the encounter on their Instagram accounts last week. Drew Hutchison posted his photo to Twitter. “Their visit was arranged by pitcher Mark Buehrle, who recently met the owner of a small zoo and came up with the idea,” according to the National Post. “We urge the Toronto Blue Jays to cease the practice of posing with wild animals for the safety of the animals involved and to set a good example for the kids who look up to the Blue Jays,” Fink writes.